The Beaver is a 2011 drama film about a depressed man who adopts a beaver hand puppet to communicate with people around him. Synopsis: Walter Black (Mel Gibson) is suffering from a deep depression. His relationship with his family is strained and the toy company he inherited from his father is nearing bankruptcy. 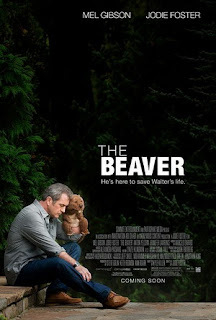 After his wife Meredith (Jodie Foster) asks him to move out, he finds a beaver puppet in the dumpster and puts it on then begins drinking heavily in a hotel room. At the end of his wits, he prepares to end it all. Right before he jumps off a high ledge, the puppet begins talking to him, causing him to fall back and saving his life. He begins talking to himself and others through the puppet, claiming that the puppet is a treatment program to create a psychological distance between Walter and the negative aspect of his personality. With this new personality, he finds renewed vigor, gets close to his family again, and sparks creativity within his company. The success gets him a lot of publicity and respect. Things go smoothly until the beaver begins taking over his life. The movie only had a limited release. Mel Gibson. Many people hated him that time; he was branded a racist alcoholic. Anyway, the film can still recoup its losses (and even profit) through DVD sales. The movie has been going the rounds of film festivals worldwide and has received warm reception. Since its release, the fame of one of its stars, Jennifer Lawrence, skyrocketed and that can bring interest into this film even though Lawrence only plays a supporting role. 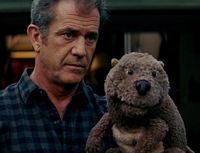 The Beaver is centered on Walter's struggle with mental illness. At first, it is severe depression. Then it escalates into dissociative identity disorder (split personality), with The Beaver becoming the main personality while the true Walter takes the back seat. With The Beaver in command, things are good. This personality is like Walter's ideal self -- he is a smooth talker, highly motivated, very charming, really smart, very confident. Too bad he's only an alter ego (and a hand puppet, at that). Conflicts arise when Walter begins to snap out of his ennui and wants to come back. The film realistically portrays deep depression. Walter sleeps a lot and slogs through daily life without emotion or motivation. Is the split personality part realistic? That is up for debate. What caused Walter's depression? It is not really clear in the movie. His problems at work and at home may be effects, rather than cause, of the illness. Some people, especially here in the Philippines where mental health is a taboo subject (and going to a therapist can get you labelled crazy and land you a scandal), when they think depression, they think emo, tears, tragic events. But sadness ≠ grief ≠ depression. Not all depression need a tragic reason; sometimes it just happens -- a medical thing. We are all slaves of brain chemicals and physiology, after all. What is hinted at is that Walter's depression is genetic. His father is mentioned in passing to have had it and his son Porter (Anton Yelchin) is later shown to be prone to it. The acting in this movie is good, which is not surprising since Jodie Foster and Mel Gibson are the lead actors. Foster convincingly portrayed a conflicted woman who loves her husband yet has to let him go before he drags the whole family down with him. Gibson nailed Walter's fight with his personal demons. I hadn't seen a Gibson film in such a long time; watching him in The Beaver reminded me why he was one of the biggest stars during my youth. There is a talking hand puppet and a borderline ridiculous fight near the end, but with the stellar performance of the two lead, the viewers are able to accept the story as serious. Gibson's effort in voicing the beaver also deserves merit. A lot of viewers thought the puppet's voice and British accent were done by someone else, but it was all Gibson. Walter and Meredith's kids in the movie are likewise likeable. They are quiet, loner types but not the stereotypical ones. The younger kid Henry (Riley Thomas Stewart) is low-profile and is sometimes bullied at school, but at home, he is a well-adjusted kid who loves his family and enjoys kid stuff. The older child Porter, who is in high school, hates his father, but unlike stereotypical angsty movie teens, he does not act out by doing drugs, hanging out with bad kids or doing other self-destructive behavior. The subplot involving Porter and Norah (Jennifer Lawrence) is probably the only thing that I don't like much about The Beaver. It seems drawn out and unrealistic. Norah is the pretty class valedictorian and cheerleader, yet she does not seem to have any set of friends. She can write a ten-page report in an hour but cannot write a decent graduation speech, to the point of having to pay Porter $500 just to write her speech. Her character is needed to make Porter's character grow but I just find Norah rather boring. The dynamics between Porter and his dad Walter, on the other hand, is interesting. He dislikes and is ashamed of his father and he keeps tabs of similarities they share in an effort to actively be not like him -- yet he is just like him. When he tastes depression first hand, albeit shortly, he gets to finally connect with his father and break down all the emotional barriers he has put up. I agree with you when you said that having a beaver puppet at the center of the plot made the movie childish. It made me recall of the comedy movie of a man with a teddy bear. The movie is interesting because of the weird storyline and, of course, because Mel Gibson is there.